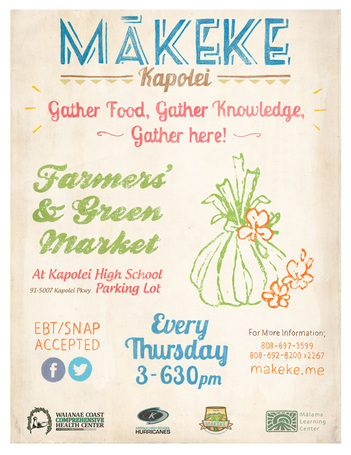 Mālama Learning Center, Wai`anae Farmers' Market, and Kapolei High School are partnering to provide the community with Mākeke Kapolei, a weekly farmers' and green market. Live, eat, and learn sustainably! Join us every Thursday (except major holidays) - 3:00 - 7:00 p.m. at the Kapolei High School parking lot (southwest corner). We are closed on major holidays. We envision an O‘ahu community that is healthy in mind, body and spirit by providing vibrant gathering places for the community, local food producers and Hawaiian cultural practitioners to connect, share, learn, teach, entertain, and express values that lead to healthy and affordable habits. We gladly accept EBT and SNAP benefits! on the purchase of fresh fruits, vegetables, poi, and pa`i`ai. 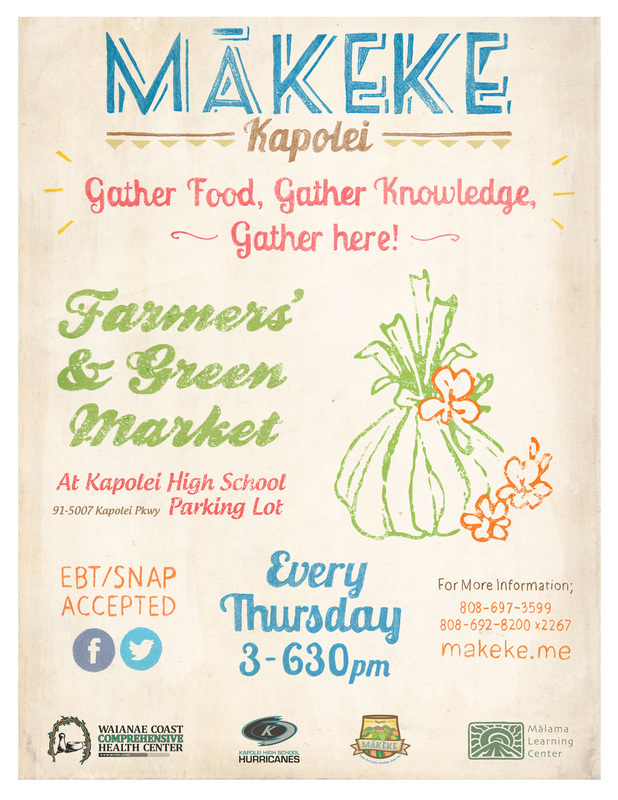 Mākeke Kapolei PSA - Gather Food, Gather Knowledge, Gather Here! from Malama Learning Center on Vimeo. For more information, call Wai'anae Farmers' Market at 808-697-3599. New vendors welcome; low booth fees! Marine Debris OH#6 from Malama Learning Center on Vimeo. Adriana’s Farm- fresh local produce. KHS Shave ice- local shave ice, sugar free shave ice and bottled water.